Our Mission: Is to provide our community neighbors with supplemental food in a safe and friendly atmosphere. 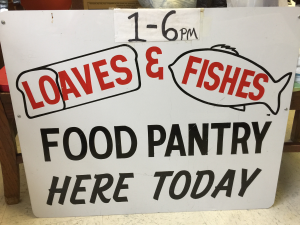 When and Where to Come: The Loaves and Fishes Food Pantry has been serving the New Market, Quicksburg, and Forestville area for 30+ years. The food pantry is located at the rear of the church, entering from the John Siever Road parking lot. The pantry is open to serve patrons from 1 p.m. – 6 p.m. on the 3rd Thursday of each month. In case of emergency, the food pantry offers a 2-day supply of emergency food when the pantry is closed. Emergency food may be obtained at the church office from 9 a.m. – 3 p.m. Monday through Thursday. The church office is located at 9320 N. Congress St., 540-740-8959. If you are eligible for our program, we are happy to supply you with one week’s worth of food each month. Please stop and talk to our staff to get started. There are two categories of food for distribution: USDA food and Pantry food. Eligibility for receiving this category of food is based upon need as defined by the USDA. Certain federal programs such as SNAP automatically qualify you to receive this food. Otherwise, qualifications are based on income guidelines set by the USDA. Anyone who is in need of assistance with their monthly groceries may receive this category of food. It is paid for by our generous supporters. However, to get started everyone will need to come to the pantry on the 3rd Thursday of the month to apply. No one leaves empty handed. 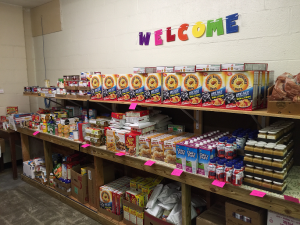 The Loaves and Fishes food pantry provides food to local residents in need at no cost once a month. 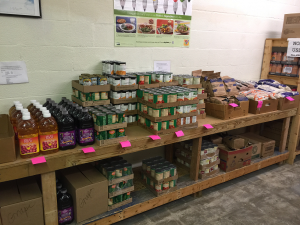 The food pantry is able to purchase food at greatly discounted prices, so your monetary contributions go further with us than food donations, but we are very grateful to receive either. We are a tax-exempt organization and donations are tax deductible. Esta institucion es un proveedor de igualdad de oportunidades.